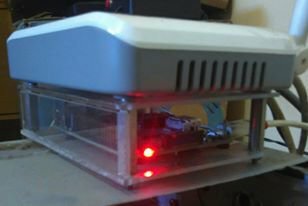 Raspberry Pi is a very nice small single board computer system, because it is low cost, compact, and low power. It is powerful enough to do many things, so we can use it for “all in one” servers, ranging from web, database, backup, ftp, or even for ipcam recording. For all of those services, it is often needed to be accessible via remote SSH login. To enable SSH login, run “sudo raspi-config” and go to [interfacing option] -> SSH . After enabling SSH the system may show a warning for changing default password. Change the password for pi by command “sudo passwd pi”, and the root by command “sudo passwd root”. Changing this default password after enabling the SSH access with the new one is very important because the raspberry pi is now can be accessed by anyone from anywhere (depending on the network accessibility). To enable root login via SSH, edit the ssh_config in /etc/ssh/ssh_config by command “sudo nano /etc/ssh/ssh_config”, and change the value of “PermitRootLogin” to “yes”. Save the file and then restart the ssh service by command “/etc/init.d/ssh restart”. Now the root account of the Raspberry Pi is ready to be accessed via remote SSH. First, I want to say that I write this tutorial mainly for my own work’s documentation, because once we setting up a system for our need then there will be high probability that we need to do the same thing again in the future for maintenance. I had ever thought in the past that creating our own work’s documentation is not important since we can browse every tutorial on the net again if we need it someday, but my experience told me that it would often be very painful to find the required tutorials since what we do is usually integrating many things, where tutorials are spread in many different topics and many different resources. Most of today’s web hosting server technology provides backup tools which is fully automated, but it is always useful to add redundant backup locally in our own office, keeping more peace in our mind when the remote backup gets into trouble. A Raspberry Pi single-board computer is employed for this purpose since its is low in cost and low in power consumption, and it is already available in my office for providing many other server functions for our needs (an ftp server for local storage and an ip-cam server for local recording, monitoring, and remote recording relay). How to set up a Raspberry Pi won’t be presented here, but for you who hasn’t been familiar with Raspberry Pi, you can learn everything about it here. Choose the B2 option (Console Autologin Text console, automatically logged as ‘pi’ user) by down arrow to move the cursor to the option, then pres tab to select the <ok> button, then press enter to set up the selection and back to the main menu. From the main menu then pres tab to select the <finish> button and then press enter to accept the config, then a confirmation dialog will appear to ask to reboot, select <yes> and the system will reboot without starting the desktop GUI. Before deactivating the GUI you must check the ip-address of the Raspberry Pi system by “ifconfig” command, so you can log to the terminal using SSH (enable by default in raspbian installation) by the ip-address after the GUI is deactivated and the screen, mouse, and the keyboard have been detached. To set up the 16MB RAM for the GPU, you can use the command “sudo raspi-config” and go to the Advanced Options and you’ll find it. Add the line /dev/sda1 /mnt to the bottom line (before the comment line #..), where the /mnt is the mouting point of the hard drive. The /mnt folder is the default folder provided by the system for the hard drive, but you can choose a different folder by creating the folder first. After editing the line then you can press ctrl+x to exit, don’t forget to save (with the same name) and reboot the system. See if after reboot the folder reflects the content of the hard disk. Update: after reinstalling with the new version of Raspbian, the attached harddisk which is formatted with ntfs under Windows is always set automatically to read only, and the solution is by installing ntfs-3g (apt-get install ntfs-3g) on Raspbian, and then change the fstab line to “/dev/sda1 /mnt ntfs-3g defaults 0 0”. The above yum command uses the -y option to automatically answer ‘yes’ to all questions during the installation process. To test the installation on each computer, just type the rsync as the command, then the help of the rsync will be shown, indicating that the command is recognized and executed. The number 4321 is the SSH port number (default 22) of the remote host, use your own setting. The remotehost.com can be changed to the remote host’s domain name or its ip address. If the ssh tool is fine then you’ll be asked for password and logged to the remote host through the Raspberry Pi, then type exit to return from the remote to the system. If everything is okay then you’ll be logged without being asked for password. Exit the nano editor by ctrl+x and save to the same filename (rsync.sh). Add the line “33 6 * * * sh /root/rsync.sh” in the bottom line, exit and save to install the new cron job. This means that the script (rsync.sh) will be executed at minute 33, on 6 o’clock every day, every month, and every year by the Raspberry Pi (by root user). Change this setting (the minutes and the hour) to select the best time, when bpth local and remote server is not in peak (busy) hours. Since website data is not only consisting of files but databases as well, we should set a cron job in the remote host to dump (using mysqldump) all the databases to the file inside /home or /root folder.